Ben Zorn's dog isn't the only special love in his life anymore. Ben, 28, has confirmed he's got a new girlfriend, and her name is Stacy Santilena. The former The Bachelorette and Bachelor in Paradise contestant appears to have found the woman he's been searching for on reality TV off-camera. 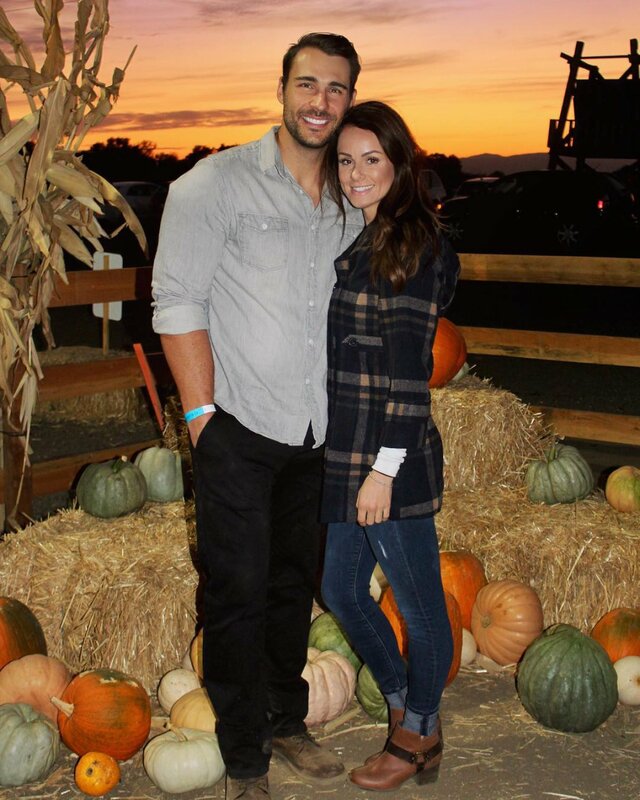 Ben posted an adorable photo of the himself and Stacy, a San Jose, CA dental assistant, at a pumpkin patch on Tuesday, October 31 with the following caption: "How did I get so lucky to have you FALL into my life," adding a heart emoji and a "birthday fun" hashtag. Stacy shared the same photo one day later, writing, "You. Exactly the way you are... I love that sh-t..." along with a pumpkin and heart emoji. Fans have probably been speculating Ben is in a relationship for about a month now. On October 7, the personal trainer shared his first photo with Stacy, although he did not tag her name at the time or indicate the nature of their relationship. In the picture, Ben was standing with his arm around the brunette beauty as Blue Angels were flying behind them. Ben wrote alongside the photo, "I feel the need... the need for speed." Meanwhile, Stacy had occasionally posted photos of herself Ben for quite some time. However, it remained unclear whether the pair were dating since Stacy is one of Ben's personal training clients and he has served as her personal trainer since at least February. Stacy has competed in fitness competitions, repeatedly thanking her coach for her "booty by Ben." It wasn't until September 27 that Stacy -- who competes in fitness competitions and regularly tags her photos with #bootybyBen" and #bodybyben" hashtags -- hinted her relationship with Ben wasn't just professional anymore. "Finally done kissing frogs," Stacy captioned a sweet photo of the pair enjoying a concert at Shoreline Ampitheatre At Mountain View. But Stacy's hashtags on the post -- #bestieverhad, #bestfriends, and #happy -- also created some confusion for her followers. Ben first appeared on The Bachelorette's eleventh season starring Kaitlyn Bristowe in 2015. After failing to win Kaitlyn's heart, Ben tested his luck on Season 4 of Bachelor in Paradise in Summer 2017. He left empty-handed because none of the bachelorettes were right for him. Ben therefore returned home from Mexico on his own accord to reunite with his beloved dog, Zeus. And yes, Stacy seems to love and get along wonderfully with Zeus based on their photos.